Looking for a Used 5 Series Gran Turismo in your area? CarGurus has 298 nationwide 5 Series Gran Turismo listings starting at $7,550. Are you a BMW 5-Series shopper who wants the performance, style, and swagger of the sedan, but who needs the versatility of a wagon? Your prayers have been answered--and fear not, you won’t have to own a station wagon. Instead, you can drive a 2016 BMW 5-Series Gran Turismo (GT), which may receive minor trim updates for the upcoming model year, possibly including a new in-line six-cylinder turbocharged engine. The 2016 BMW 5-Series Gran Turismo is a hatchback version of the sedan we all know and love, with a bit of a stretch in all dimensions. Most importantly, the length increases about six inches, creating extra space for the rear passengers, who also happen to sit a bit higher up than in the sedan. Although BMW has found fans for this arrangement worldwide, it has proven particularly important in China, where owners are often driven rather than driving themselves. The Gran Turismo also happens to be a very capable cargo hauler, offering about 64 cubic feet of space with the rear seatbacks folded, putting it in mid-size crossover territory. The rear half of the cargo space is flat to the hatch’s opening, making the vehicle easier to load. 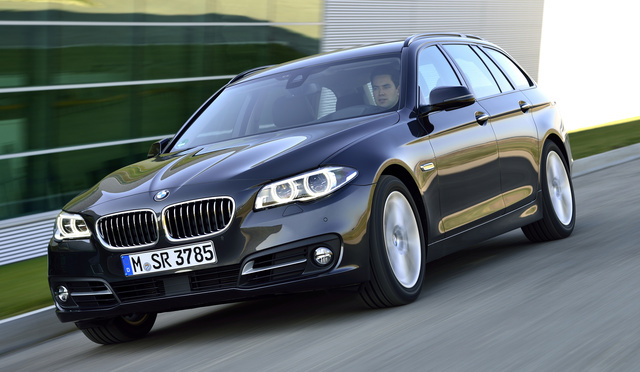 BMW has very craftily melded its sedan’s driving feel with SUV-level passenger space and excellent passenger comfort. Outside, the BMW 5-Series Gran Turismo has a beefier, puffed-up look that many find appealing. The interior remains largely unchanged from the 5-series sedan, except for the slightly-elevated rear seats that offer part of the crossover appeal. Popular interior features, such as the multi-information head-up display with navigation, are available as well. Unlike the endless number of 5-Series sedan trims, we expect the 2016 BMW Gran Turismo to appear in just three forms. First is the 535i Gran Turismo, the rear-wheel drive GT with the company’s turbocharged, in-line six-cylinder engine. This engine produces 300 horsepower and 300 ft-lb of torque from a very low 1,300 RPM, almost diesel-like in performance. Coupled to an eight-speed automatic transmission, the 535i GT can run from 0-60 MPH in 6.2 seconds, quick for a car weighing in at 4500 pounds. Prices for the 2016 535i Grand Turismo will start at around $63,000. Buyers usually opt for one of the two “lines,” Luxury or M Sport. The Luxury line is an appearance package with its own alloy wheels, run-flat tires, and custom leather. The M Sport line alters the car's looks slightly and moves the top-speed limiter to a higher setting. A 2016 M Sport 535i GT with options like heated seats, keyless-entry, and a rear-view camera will cost about $70,000. 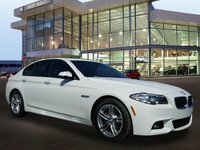 The 2016 BMW 535i xDrive Gran Turismo has nearly identical specifications to the 535i, but it adds all-wheel drive and its price will run about $3,500 higher. Interestingly, BMW says the xDrive lowers its 0-60 time by a tenth of a second over the 535i despite the added weight. We would not be surprised if the 2016 GTs with the in-line six-cylinder turbo engine are re-badged the “340i," receiving the same engine upgrade as the sedans. The upgraded engine adds 20 hp and a bit more torque, and will probably come along in late 2015 or early 2016. At the top of the 5-Series Gran Turismo line is the 550i xDrive, with BMW’s popular 4.4-liter turbo V8. Producing a whopping 445 horsepower and 480 lb-ft of torque from just 2,000 RPM, the 550i xDrive can run from 0-60 MPH in 5.3 seconds. The 550i xDrive GT's curb weight of approximately 5,000 pounds is all that holds it back from road-rocket status. It starts at nearly $75,000, includes all-wheel drive, and offers either the Luxury or the M Sport line. Adding in options like heated seats and the head-up display will push an M Sport line 550i xDrive GT to over $80,000. The Insurance Institute for Highway Safety has not tested the BMW 5-Series GT, but it has tested the similar 5-Series sedan, which scored a low Marginal on the small-frontal overlap crash test and is therefore disqualified for a top safety rating. BMW fans looking for more space and versatility in a 5-Series will appreciate the Gran Turismo’s rear passenger comfort, cargo area, and taller profile. And they'll be happy to know they don't have to sacrifice much of the 5-Series’ road manners or panache. What's your take on the 2016 BMW 5 Series Gran Turismo? Users ranked 2016 BMW 5 Series Gran Turismo against other cars which they drove/owned. Each ranking was based on 9 categories. Here is the summary of top rankings. Have you driven a 2016 BMW 5 Series Gran Turismo?